"Arielle Sings" is now available. Arielle has been blessed with many gifts since birth. Intuition, psychic abilities, music and art have always been part of her. Throughout her life, master teachers were sent to her, guiding her to the next level of her development. Then, twenty years ago, she was ready to meet Lavandar, her Galactic Master teacher. Among the many facets of her training, she learned galactic astrology, including the Star Marking Codes. She has an uncanny natural ability to read energies and interpret them with crystal clarity. Her unique talent for analogy will 'speak your language', so her advice will make sense for you. These talents and abilities make her a master communicator. She is also a Prosperity coach, and will empower you to create abundance in your life, regardless of a 3rd dimensional economy. 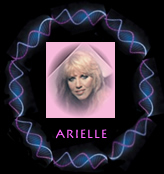 Arielle has used her knowledge of Astrology as a divination tool for the past twelve years, helping people with their challenges and guiding them to their Natural State. When you live in Natural State, everything seems to go your way. Her deep understanding of the Star Marking Codes helps you realize your Rites of Passage. All Star Seed and Lightworkers have these codes in their natal astrological chart, since the timing of your birth is deliberate. The extraterrestrial races with "children" on the Earth use these particular frequencies like a private phone line to guide and help when necessary. Would you send your children into the unknown and not provide a method for communication? While a few Star Seed and Lightworkers are born with their memories intact, most of us agreed to forget our origins until activated at some later time. We were born with those frequency codes in our DNA and the natal astrological chart, which would be activated by planetary galactic frequencies. So you awaken to find that you didn't come with a manual to put the pieces together, yet feel an urgency for clarity. Understanding your Star Markings, Natural State and Rites of Passage brings that clarity more quickly. With the New Age of Reason emerging, NOW IS THE TIME. Please include your accurate birth info, month/day/year, exact time and place, PLUS your phone number and current residence! Any missing info may cause a delay in your reading.